After getting bogged down in sand, and damaging its two right wheels, all is not looking good for the Mars Spirit Rover. Nasa's admitted it will be stuck in its rut for all eternity, with little hope of moving it. 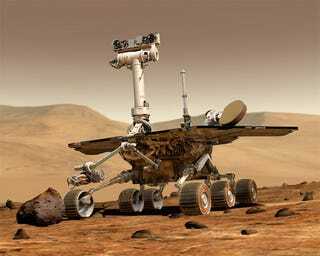 Part of the massive $900m Mars Exploration Rover program, the little Spirit Rover hasn't had much luck on the planet, but Nasa is still hopeful it can collect data from the soft patch of sand it's bogged in. It's powered by the solar panels on its back, but due to the angle it's stuck in the sand, the Spirit Rover must be turned slightly to catch some valuable sun rays over the coming months of hibernation, waking up in August to start collecting information on its surroundings.